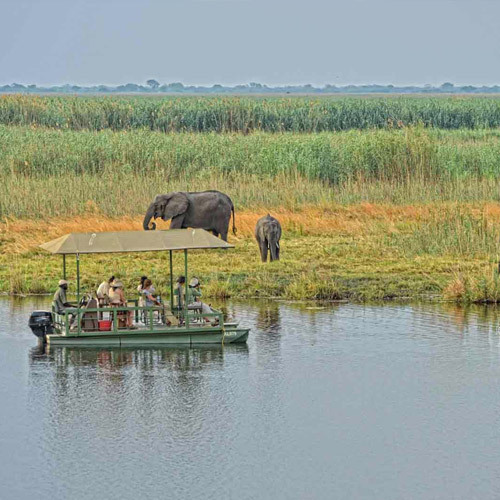 Navigate your way through the enigmatic wilderness and reed beds of the Okavango Delta. View the abundant wildlife of this fertile land while poling your way on a traditional mokoro through watery pathways. See some of Africa’s largest elephant herds at its many nature reserves and discover a land of true contrasts in the heart of southern Africa. Central Kalahari – visit the world’s second-largest game reserve, situated in central Botswana, where traditional Bushmen find their home. Botswana – camp siteChobe National Park – featuring the most remarkable concentration of elephants roaming its vast floodplains, verdant grasslands and baobab woodlands, this extensive reserve is the second largest national park in Botswana and covers 10,566km². Kwando River – the diverse variety of habitats along the Kwando provides many opportunities for bird and game viewing, with large herds of elephant walking along its banks. 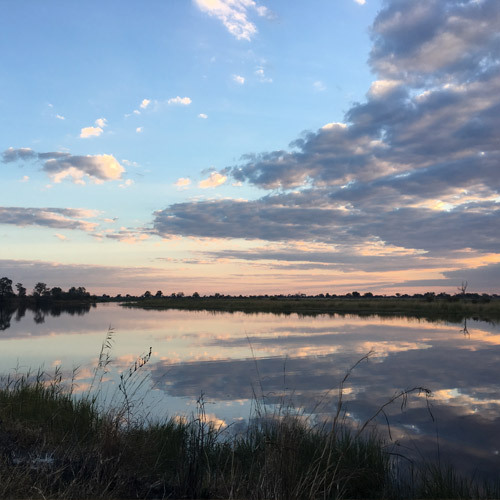 The Kwando River forms the border between east and west Caprivi, 100km west of Katima Mulilo and also forms the border of both the Bwabwata and Mudumu National Parks, an extensive wilderness stretching from the Kwando in the east to the Okavango in the west. 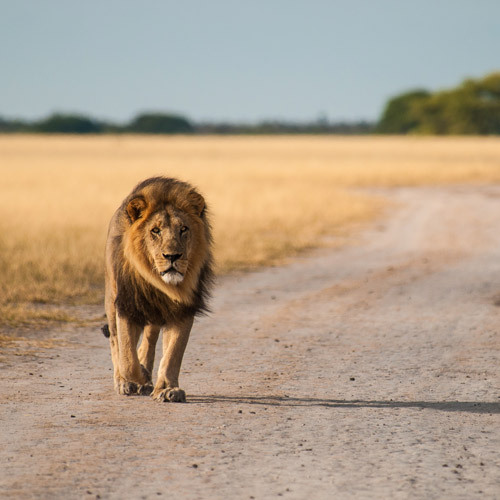 Linyanti Marshes – watch as Africa’s big predators stalk their prey through the reserve’s rolling marshland, West of Chobe National Park in Northern Botswana. 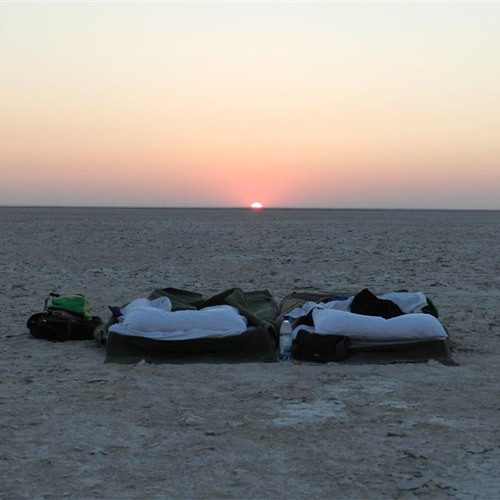 Bots ellieMakgadikgadi Pans – view vast numbers of antelope, wildebeest and zebra as they wander through ancient pans glistening with salt. 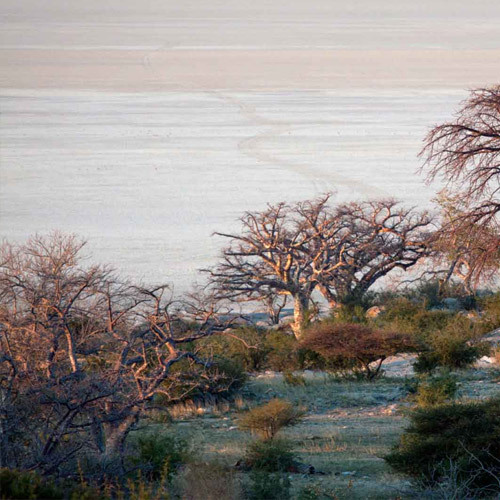 Once an expansive super lake covering an area of 80,000 km², the Makgadikgadi Pans were formed due to climate shifts, creating these impressive structures more than five million years ago. The best time to visit the area is during the dry season from March to September. 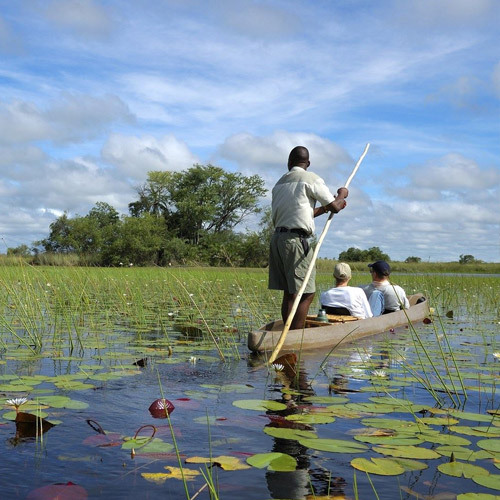 Okavango Delta – explore the labyrinth of lagoons, lakes and hidden channels known as the Okavango Delta. 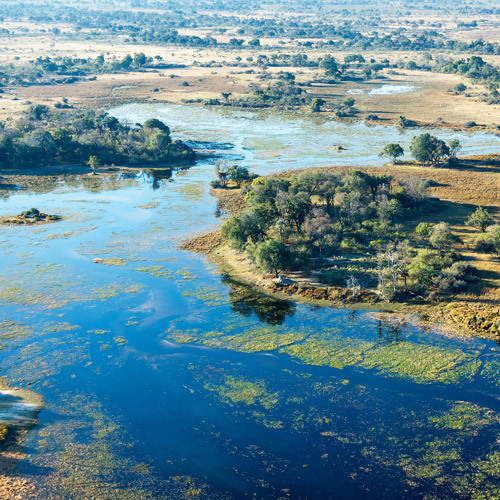 Winding its way over a distance of over 17,000km², the Okavango Delta is situated in the Kalahari sands, making it a popular watering hole for the abundant wildlife in the area. 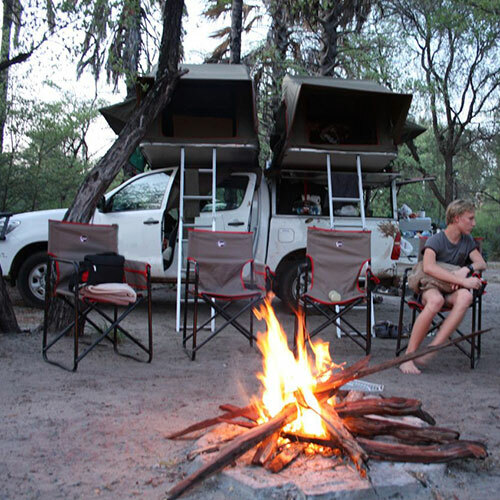 Botswana – quad biking in MakgadigadiGame viewing – herds of wildlife can be found throughout the country, both in and outside the National Parks. Botswana is also home to one of the largest elephant populations in the world and a close encounter with these majestic beasts is a certainty. Game viewing from Mokoro – one of the most popular ways to experience the African bush. A Mokoro is traditional dug out canoe that is guided by a qualified guide along the waterways. Sit back and view various bird and wildlife as you glide by silently. 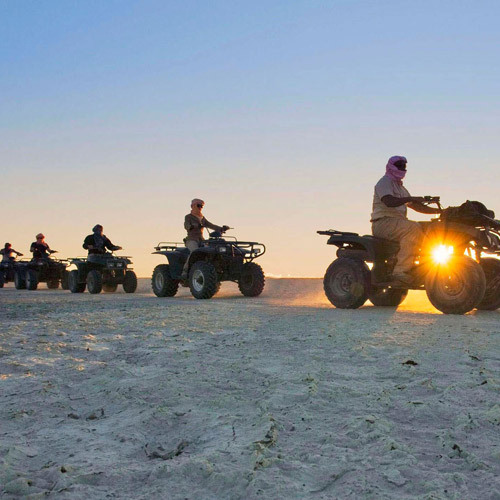 Quad biking in the Makgadigadi – an exhilarating activity by quad bike on the lunar landscape of Ntwetwe pan. Learn more about the archaeology, geology and zoology of the salt pan. Enjoy endless views over the breathtaking expanse and visit the Meerkats that call this unique location home. 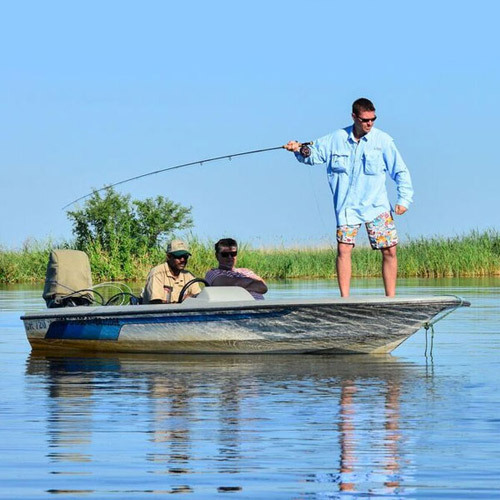 Fishing – fishing can be enjoyed in the Chobe and Linyanti Rivers as well as the Okavango Delta. There are different opinions as to when the best time to visit Botswana is. Some people prefer the dryer months when the bush is less dense and game congregate around available waterholes as water resources are limited. Others prefer to visit during or just after the rain season when the bush is lush and green, however wildlife may be more difficult to spot. The Winter period is from June towards the end of August. The months of August through to October are generally good for game safaris. This is peak period as well and availability can often be difficult to get for last minute bookings. The rain season is from December through to February. Keep in mind that flooding may occur in certain parts of the country and the rains have a marked effect on the gravel / sand roads.